RARELY does a legend motorcycle racer have a son who follows in his foot-steps. In fact, even if you look on the international stage, second generation champions can be counted on one hand but right here in our own back yard we have a father and son who have achieved an enviable scramble and motocross championship haul. I introduce to you, George and Andrew Bailey. A little side project I have on the go right now is compiling a complete history of every National and State Scrambles, Motocross, Dirt Track, Trials, Enduro and Speedway Champion throughout Australia from the 1950s to today. Yeh I know, a huge task but very rewarding and so far I have some great help from many different sources. So when researching the scrambles racing days from the 1950s the name George Bailey kept on coming up in the results at National, Victorian, New South Wales and South Australian Scramble Championship events. I kept thinking to myself, ‘man, this Bailey character sure could ride’ and as a result of George’s efforts and many other legends from that era I dedicated my March 2013 Dirty Torque to the racing from the 1950s. A week or so after the March issue of Cycle Torque hit our local dealerships a good mate of mine and multi Queensland Motocross Champion Andrew Bailey contacted me to tell me that George Bailey is in fact his ‘dear old dad’. You dead-set could have blown me over with a feather. I have known Andrew since the early ’80s and true to the big man’s modest demeanour he never once mentioned that his dad was a legend of our sport. So where did it all start? Well, 1953 was a big year for George Bailey, after belting around the local tracks south of Melbourne since the late 1940s the likeable 23 year old Frankston lad won the Victorian 350cc Scrambles Championships held at Moe on an AJS and more importantly married the beautiful Glad Taylor, a love affair that would see the test of time and produce four children, Robin, Karen, Andrew and Amanda. In 1954 George purchased a 500cc Matchless from a mate, stripped it down to race trim and won the Victorian All Powers Scrambles Championship at Point Henry and from there on and right through to 1958, if George Bailey turned up to a local, State or National scrambles meeting it was a fair bet that the talented Victorian would take away more than his share of the silverware. In fact, at one stage during the 1950s George had eleven State and National titles to his name at the same time, a rare record by anyone’s standards. But not only was George a great rider he was more than handy with the tools and in 1954 George cleared the kitchen table, dumped an AJS motor in the middle and turned it into a fire breathing, methanol burning 250cc racer that was a long way ahead of its time with a super short stroke and a much larger modified piston than was deemed conventional for this era and something that has become the norm among the modern four strokes 40 plus years later. With the 250cc ‘Bailey Special’ ready to race (and the kitchen table back it’s normal duties), George had the 500cc Matchless, a 350cc AJS and eventually a BSA Bantam 125cc and a 500cc Triumph in a Matchless frame to complete his stable so over the next three years there wasn’t a title that was safe from the raw talent and determination of George Bailey. Get this, in February 1955 George won the Victorian 250cc Scramble Championship on the Bailey Special, then in June he took out the Wodonga 60 Mile Motocross on the Matchless and in August won four NSW Scrambles Championships in one day at Moorebank. He narrowly missed out on a fifth title with a second in the 250cc class riding his brothers’ 140cc Triumph Terrier, saving his 250cc special for the 350cc event. Then in 1956 George won the Victorian and South Australian 250cc and 500cc Scrambles Championships and drove back up to Moorebank in May for the Australian Scrambles Championship where he won the Ultra-Light Weight title, the Light Weight title on the Bailey Special and the 500cc title on the Matchless and would have won the 350cc class on the Bailey Special but a minor mechanical failure after landing hard off a jump handed the title to arch rival Peter Nicol. As a side note to the 1956 championship at Moorebank, it was the first EVER televised outside broadcast sports event for channel nine so the course was doubled in length with a lot of sand shipped in which favoured the West Australian riders so with the absolute cream of Australia’s talent on hand the last thing anyone expected was for one rider to all but dominate the event. George had dropped a flywheel on his toe in the week leading up to this championship but still entered all five championship classes and despite having to take on the likes of Charlie West, Peter Nicol, Blair Harley, Les Sheehan and Charlie Scaysbrook to name a few. George racked up three championship wins and was going for championship number four in the Unlimited class but sheer exhaustion and a boot full of blood thanks to the toe injury dropped Bailey back to fourth place behind three West Australian champions Charlie West, Peter Nicol and Don Russell. It is hard to fathom but scrambles in Victoria had a huge following from the general public in the 1950s and because of the intense rivalry between three of the top riders namely Ken Rumble, Les Sheehan and George Bailey, a match race was organised and held at the Cranbourne racecourse where the three champions were matched in three separate races. Astoundingly they won a race each proving only that they were all very evenly matched. George went on to win more state titles and two more national championships with his final serious race being late in 1958 where he won the prestigious Grand National All-Powers on the trusty Matchless ahead of Les Sheehan. 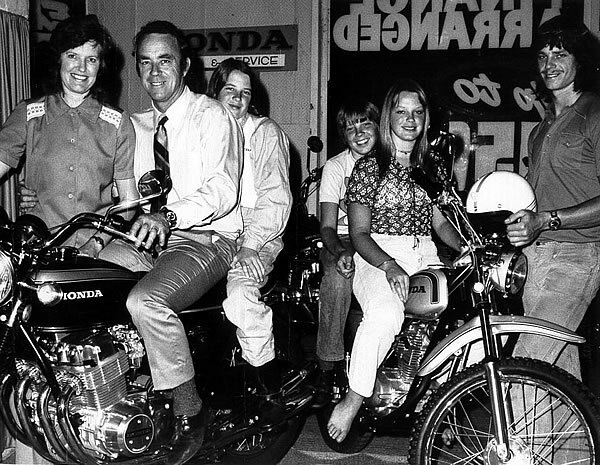 Despite putting his racing aside Bailey wasn’t lost to the motorcycle industry and after recovering from a serious illness George, Glad and the family ran a very successful motorcycle dealership in Frankston. But, the racing days were not over for George Bailey. Next month we look at what happened after George Bailey’s sons Robin and Andrew get the dirt bike bug and start racing at the very tracks that George was for so long the dominant force then see how Andrew fared as he followed in his famous father’s footsteps. Tonight is the coming together of MR MX starts and legends Charity dinner,I’m a little bit more the wiser of our Australian MX heritage from reading the above on George Bailey and even more chuffed that we are involved in the older mx bike clubs of Australia and its VMX family.love it.